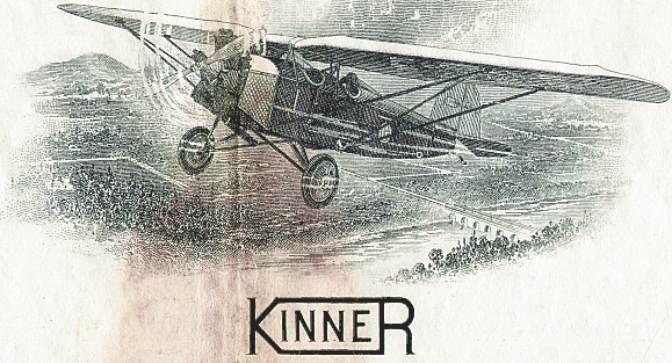 Beautifully engraved certificate from the Kinner Airplane and Motor Corporation issued in 1929. 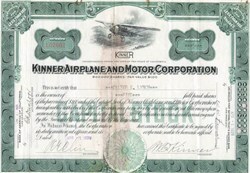 This historic document was printed by the Jeffries Bank Note Company and has an ornate border around it with a vignette of an early monoplane with the company's name below. This item has the signatures of the Company's President, W. B. Kinner and Secretary and is over 81 years old. Stained in center but does not affect signature.